Once a Cowboy - Always a Cowboy! I think the first thing is to tell you a little bit about myself. I was fortunate enough to have been taken along on enough of my Father's outings, that my love for the outdoors was acquired at a rather early age, and hopefully, will last a lifetime. I spent many evenings in the basement re-loading shells for the next day of dove shooting, or the next fox hunting adventure! With my father, I learned that the end of the trip was not the goal! Part of the pleasure was simply HOW you got there! I learned how to hand-craft arrows, sharpen knives, catch my own bait, build a small camp fire, and always, ALWAYS! never harvest what you weren't going to eat! But most of all, enjoy yourself, and get dirty! In 1996, I picked up a knife magazine at the grocery store, and have been addicted to making knives ever since! After a LOT of trial and error, I arrived at that point, where I was proud to offer my knives to anyone who also enjoyed the outdoors, or simply enjoyed the fruits of hand-craftsmanship. Since that time, I have been doing all I can to learn knife design and construction. And it has been a worthwhile adventure, indeed! My adventure continued in 2004 into the realm of the forged blade. In July of 2004 I was a graduate of the Bill Moran School of Bladesmithing, having taken the Bladesmithing Course offered in conjunction with Texarkana College as part of their continuing education. For those uninformed, it takes place in Washington, Arkansas, and is instructed by members of the American Bladesmith Society who have attained Master Bladesmith rank. I studied for two weeks with Bailey Bradshaw and Bruce Fuller. 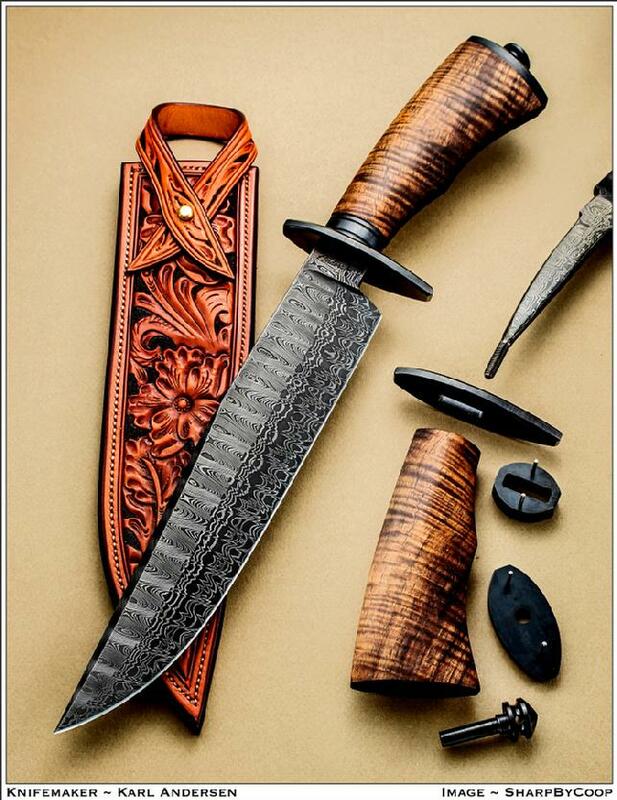 Early on in my learning adventure, I had the extreme fortune to meet and become a bothersome "understudy" of world class Damascus and Knifemaker Jerry Rados. Put simply, Jerry has forgotten more about knifemaking than most makers will ever learn. Jerry has taught me many things in the years I have known him, and they can be seen often in the knives I produce. The one lesson that stands above them all is, in his words, "Every knife you make, make it the best you can!" 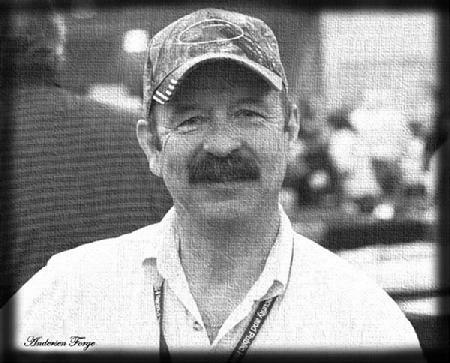 At "The Blade Show" of 2008, after four years association with the ABS, I submitted five knives to a panel of Master Smith Judges and was granted my "Journeyman Smith" ranking in the American Bladesmith Society. All knives from my workshop are entirely crafted by myself from beginning concept to the end result, right down to the last hand-stitch in the wet-molded sheath! I am proud to put my name on every knife that comes out of my workshop. My handle materials range from a wide variety of man-made materials, antler and bone, ivory, to some particularly rare hard woods from around the world. All knives come with a hand-stitched, wet molded sheath, which is waterproofed. 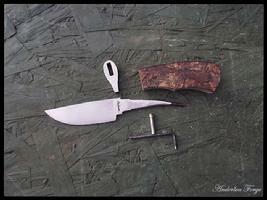 Each sheath is wet-molded around the specific knife for which it is intended. Each knife fits in its sheath snuggly! REMEMBER: A KNIFE THAT FITS LOOSELY IN ITS SHEATH IS A DULL KNIFE!!!! Knives shown on these pages are now in the hands, and on the belts, of their proud owners. This site will change, from time to time, with the addition of new knives as they get completed. Any handle material can be inter-changed with any knife - within reason! If you would like any pictures sent directly to you, or if you should have any questions, please feel free to contact me at Karl@andersenforge.com. All in all, anything I have here of value, anything about me that is good, and all the pleasures I derive from my love of the outdoors is a direct gift from the time my Father spent with me in the great outdoors, and the time my Mother spent with me when I was home. Throughout my life, up until and including now, my Mother has been my continual guiding light. She has guided my steps and shown the way back to my path when I was lost. She is the star by which I set my compass. There is a little bit of my Father in every knife I make, and it is to his memory that I have dedicated my knifemaking endeavours. He walks beside me every time I enter the woods, and I know he's looking over my shoulder at every knife I make! For the most part, I conduct business by means of email. It is understood that in some instances, personal contact by phone is necessary to accomplish the task at hand. This will be possible by calling me at 218-398-4270.